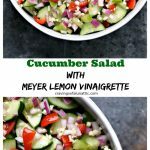 This quick and easy Cucumber Salad with Meyer Lemon Vinaigrette is perfect for picnics and potlucks. This recipe is packed with flavor yet incredibly simple to make. Spring is in full swing which means summer won’t be far behind. 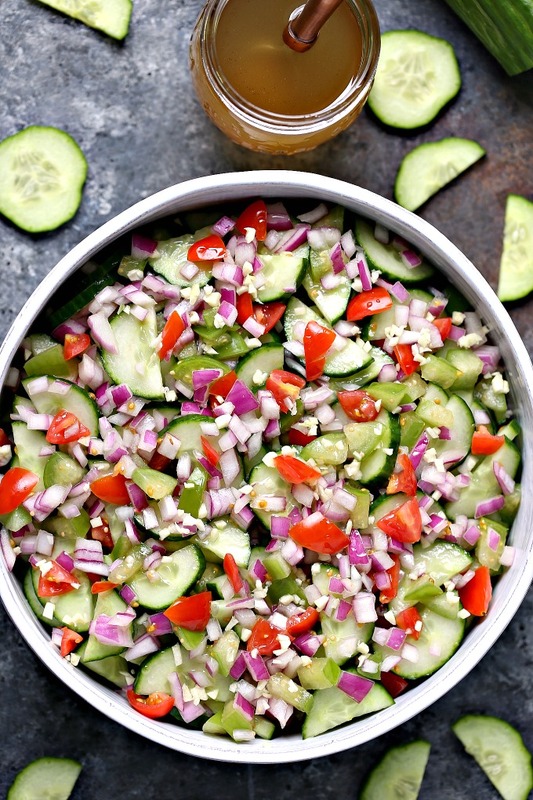 This cucumber salad with meyer lemon vinaigrette is the perfect way to celebrate any occasion. Warmer weather means cookouts, picnics and road trips. All of which I absolutely love, mostly because of the food. 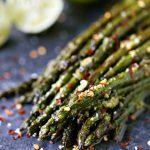 This girl LOVES her grill recipes! My family spends tons of time outdoors during warmer seasons. 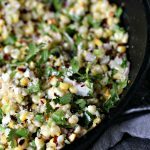 We grill every day and love making fabulous sides to go with burgers, beer brats, smoked ribs and grilled steaks. 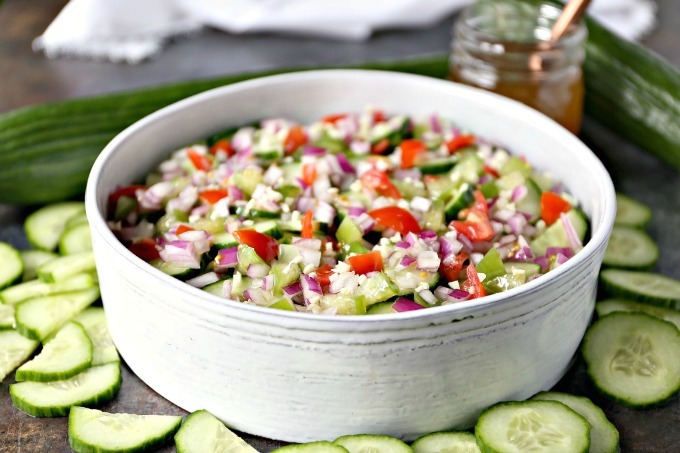 One of our all time favourite side dishes is cucumber salad. There are so many ways you can mix it up and make it your own. 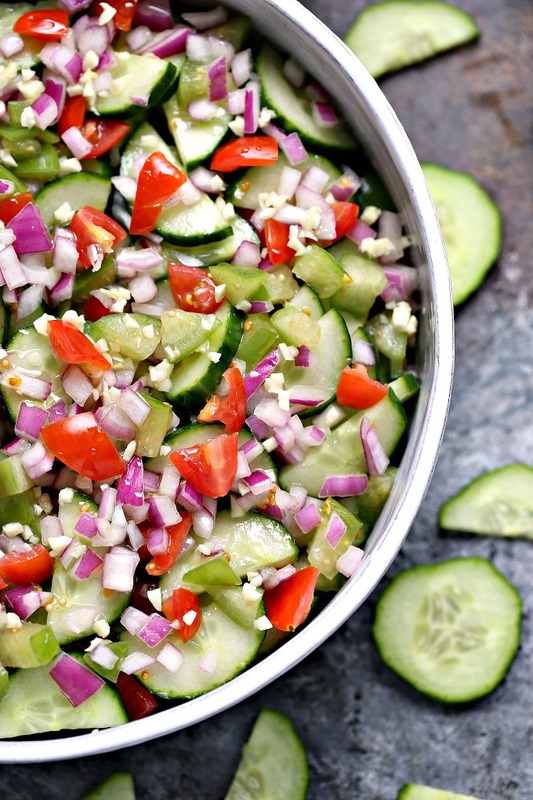 The possibilities are endless when it comes to cucumber salads. You can add fresh veggies or even fruit. 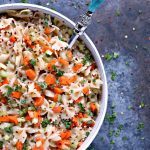 You can add spices, fresh herbs or even pasta. For me, having a ton of flavour in each bite is important. This recipe is incredibly easy yet packs a serious flavour punch. Start with incredibly fresh ingredients. Hit your local farmers market. Or use a CSA service. 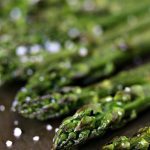 Use what is in season in your area for add-in’s. Be creative with slicing. Slice things in different shapes to add visual appeal. Think about taste but also colour. 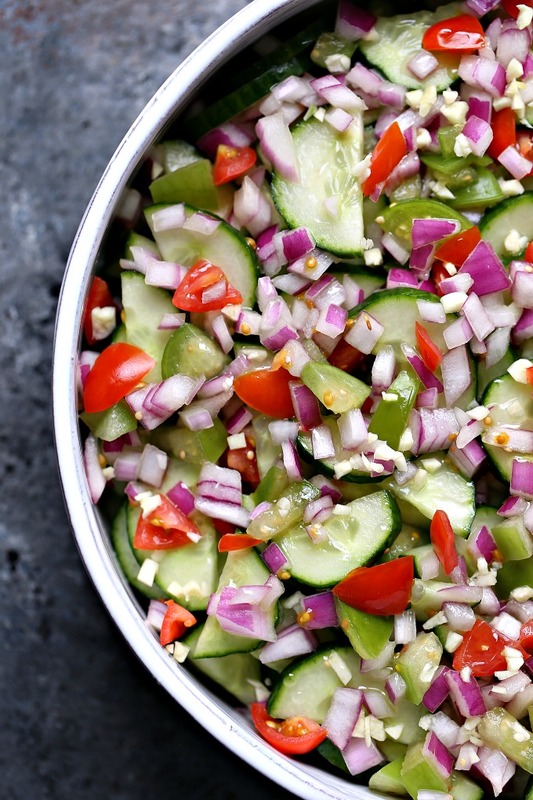 Use veggies that add a pop of colour to your salad. Use vinaigrettes and dressings that work well with your ingredients. Don’t make too far in advance because cucumbers could get soggy. Don’t salt until serving. Salt draws out water in cucumbers! 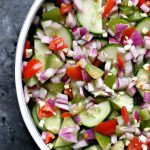 Let’s make some cucumber salad! Pour all ingredients in a small mason jar. Place lid on jar and shake until well blended. Set aside. Slice all ingredients. Toss in a medium size bowl. Shake Meyer lemon vinaigrette again then pour over salad. Toss to coat evenly. Serve immediately or store in fridge. 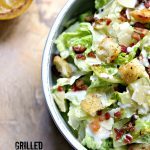 This salad is best served the day it is made. It making ahead of time I would recommend waiting to pour vinaigrette over salad until closer to the time you are serving it. You can use regular lemons if Meyer lemons are unavailable. Meyer lemons are slightly sweeter than regular lemons so you can add a teaspoon of sugar if using regular lemons. 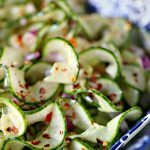 If you would like to add salt and pepper to cucumber salad add right before serving. 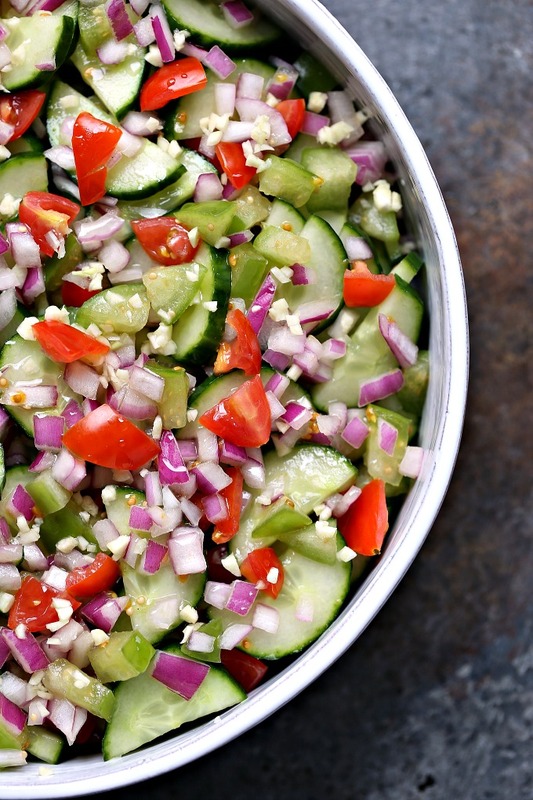 Love this salad, similar to a Greek salad, sans the feta. Thanks Jo. I used to work in a Greek restaurant so I’m a sucker for their salads. SO good!